Globular clusters (GCs) are exciting laboratories to study stellar evolution and stellar dynamics. The GCs which orbit our galaxy and other galaxies are old, densely packed star clusters which contain little dark matter. As previously discussed in this astrobite, many dynamical activities such as stellar collisions, creation of dynamical binaries (i.e., a star can capture another star when it flies by very closely), and mass segregation – the tendency for massive stars and binaries to sink inwards whereas low mass stars tend to move to the outer parts of the clusters occur, thus observing these clusters can help us understand how these clusters evolve. In this Nature Letter, the authors report “accidentally” discovering two stellar mass black holes in M22, a GC which orbits the Milky Way, while trying to find an intermediate-mass black hole in the center of M22. The authors took deep radio continuum images of M22 with the Karl G. Jansky Very Large Array (VLA), as shown in the figure below. These types of observations can probe objects which are accreting matter (e.g., from a nearby companion or accretion of interstellar gas). Although, the authors did not find what they were looking for in M22 their serendipitous discovery of these black holes is quite exciting. This is because previous theoretical work has predicted that even though several hundred stellar-mass black holes are likely to form in these clusters, we should only expect to find one per GC because of dynamical effects. This is because these black holes, which are the corpses of very massive stars, are quite heavy and will sink towards the center of the GC due to mass segregation. This effect occurs because cluster objects will undergo many collisions and these objects will reach equipartition – that is, when two cluster members experience a close encounter they will exchange momentum and energy such that the kinetic energy of these two members will equalize. Since the kinetic energy of a member is proportional to the mass times the speed squared, this effect will cause the lighter member to increase it’s speed and move outwards whereas the heavier member, during the collision, will decrease it’s speed and thus sink to the center. As the black holes sink to the center of the cluster they will undergo many encounters and mergers with the other black holes and they will merge and/or get kicked out of the GC, leaving only one stellar mass black hole behind. This happens on a relatively short time scale, ~1 Gyr, and since the GCs which orbit the MW have ages that are greater than or about 12 Gyr, there should only be one stellar-mass black hole near the center of M22. VLA radio continuum image of the core of M22. The two bright circled objects, M22-VLA1 and M22-VLA2, are the sources identified as stellar-mass black holes. The red cross denotes the photometric cluster center. Could these objects really be stellar-mass black holes? After discovering these objects, the authors looked at archival Chandra X-Ray data, which also probes accretion and binary interactions, to try to figure out what these objects are. They found that these objects were undetected in the Chandra images, suggesting that these objects have low X-ray luminosities. The ratio of their radio luminosity to their X-ray luminosity, which they measure to be log(L­R/LX) ≥ -2.6, and central location in M22 can place significant constraints on their properties and environment. M22-VLA1 and M22-VLA2 are located at projected radii of 0.4 and 0.25 parsec from the cluster center, respectively. The VLA observations along with the non-detections in the archival Chandra images, suggest that these objects are stellar-mass black holes which are actively accreting at low rates, which leads to their flat radio spectrum. The authors further suggest that since GCs only have modest amounts of interstellar gas they are unlikely to be undergoing Bondi accretion (i.e., the spherical accretion of surrounding gas), but are instead accreting matter from a near-by stellar companion. Using the radio and X-ray luminosoties of these objects, the authors estimate that the masses of these black holes are ~10-20 solar masses. This is because larger values of L­R/LX for black holes indicate that they are more massive and the authors find that the values of L­R/LX for these M22-VLA1 and M22-VLA2 is larger than those for typical stellar-mass black holes (M~5-10 solar masses) located in the Milky Way. 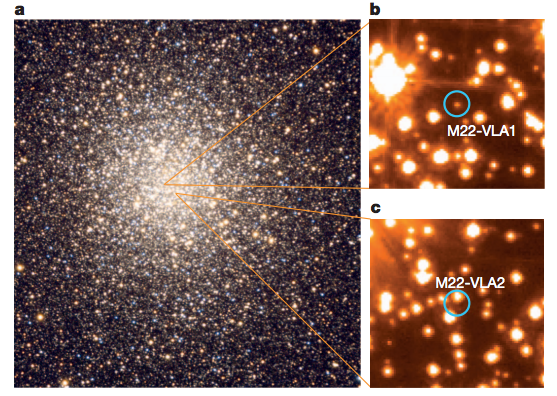 Optical images of M22 and the candidate companion stars to the stellar-mass black holes. (a) Ground based image of M22 which shows the approximate locations of these objects and (b,c) the zoomed-in location of these objects on an archival high resolution HST image. Next, the authors looked at optical Hubble images of M22 to look for optical counterparts of the radio sources, as shown above, to identify their companion stars. They find that M22-VLA1 is a close match (0.05″) to a low mass main sequence M-dwarf star (M~0.34 solar masses) and that M22-VLA2 is 0.17″ away from a ~0.62 solar mass main sequence star. 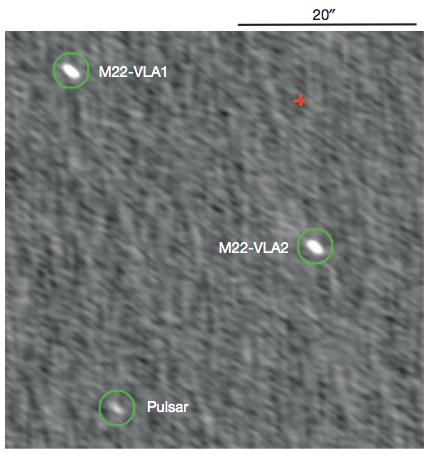 Considering the distribution of stars in the locations of these radio sources, the authors find that the optical association for M22-VLA1 is suggestive but that the optical association for M22-VLA2 is uncertain. Although, previous theoretical work suggests that GCs should only contain one stellar-mass black hole due to the dynamical evolution of the cluster, M22 contradicts this. Simulations of smaller clusters have shown that the presence of multiple black holes in cluster centers will cause the cluster core to expand significantly, which leads to a large reduction in the stellar density causing the rate of interactions between black holes to decrease. This, in turn, will cause the rate of ejection and/or merging of black holes to decrease thus allowing more than one black hole to exist in the cluster at such a late age. This might explain why M22 has the fifth-largest core radius among luminous Milky Way GCs. Furthermore, the authors suggest that M22 might even contain more black holes, either as single black holes or in binary systems that are not undergoing observable mass-transfer. They estimate that M22 might contain as many as 100 stellar-mass black holes!